Lisa Perkins joined Green & Sklarz after more than 17 years with the U.S. Department of Justice. She worked for five years as a trial attorney in the Western Criminal Enforcement Section of the Tax Division, prosecuting tax crimes in the western half of the United States, then moved to Connecticut. Until January 2015, she was an Assistant U.S. Attorney in Hartford, handling both civil and criminal litigation in federal court on behalf of the U.S. government. Her caseload included tax and financial crimes, immigration, employment discrimination, medical malpractice, Freedom of Information Act litigation and civil rights cases. 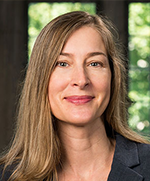 Attorney Perkins is also an Assistant Clinical Professor and Associate Director of the Tax Clinic at UConn School of Law, where she supervises law students who represent low-income taxpayers before the IRS and in Tax Court. Attorney Perkins earned a bachelor’s degree from Michigan State University, a Juris Doctor from Michigan State University College of Law and an LL.M. in Taxation from Georgetown Law.